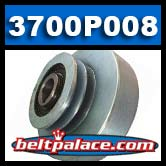 Noram Tri-Lobe 3700P008 Industrial Clutch. Kohler Engine Part # 3700P008. 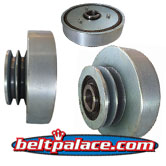 Specs: 8.1" Dia, 5" Pulley Dia., A/B Section belts (2 groove sheave), 1-7/16" Bore, 3/8" Keyway. STOCK LIMITED TO PHONE ORDERS ONLY. CALL NOW TO ORDER!